Smoke plume rises from Pu’u O’o crater on May 3. Hawaii island’s Kilauea volcano is ramping up for some new activity downslope and away from the long running Pu’u O’o eruption area. Several days ago the crater wall at Pu’u O’o collapsed. The magma that is under the crater moved downslope along the East Rift Zone of Kilauea this week. 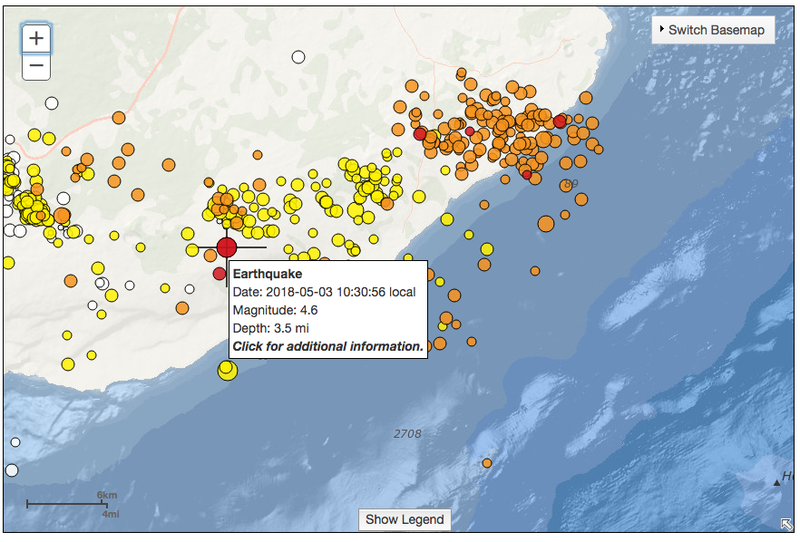 A moderate earthquake measuring 5.0 hit the Puna area this morning (May 3) at around 10:30 am. 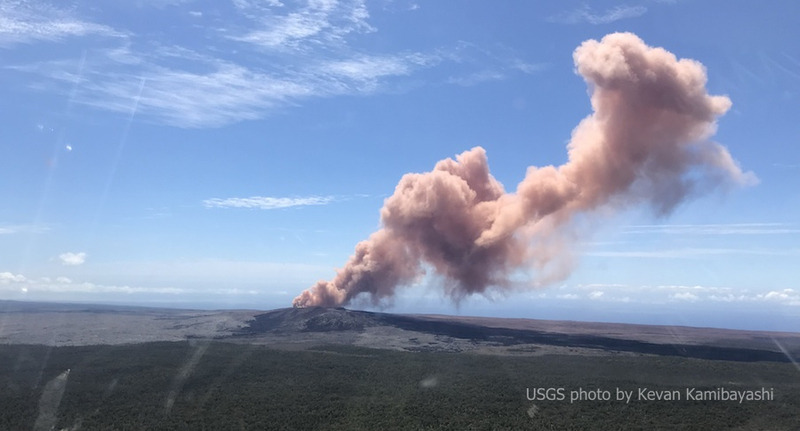 The quake caused part of the Pu’u O’o crater wall to collapse, sending out a huge plume of pinkish colored smoke. The initial intensity of the May 3 earthquake was put at 4.6. It later was revised to 5.0 by the HVO. Numerous earthquakes have occurred in the southeast rift zone of Kilauea volcano over the past several days. USGS image. The quake is one of a series of hundreds that are rocking the area. Most of the earthquakes are at the 1 or 2 point levels with a few spiking higher into the 3 point range. 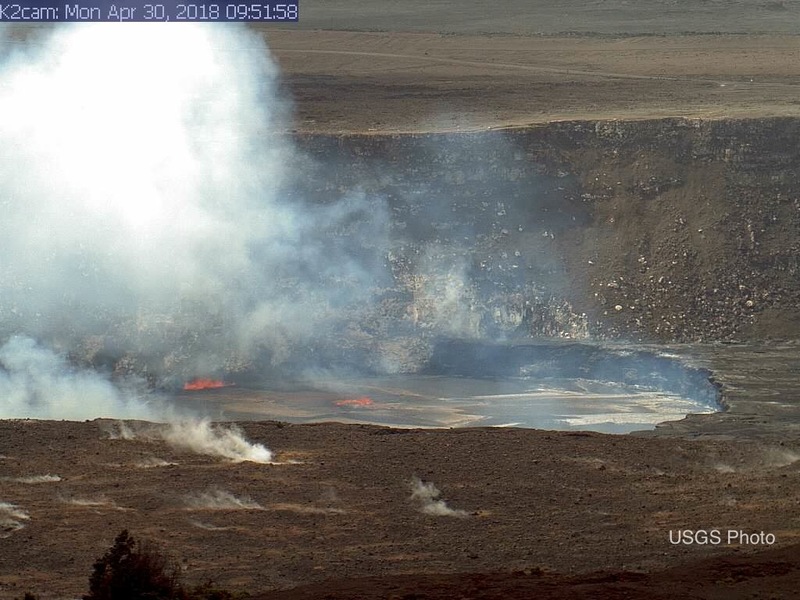 Hawaii Volcano Observatory scientists say this is a sign that lava is moving deep underground but could find its way back up to the surface a few miles away from the two current eruption sites. Miles downslope and we are talking about several subdivisions in the lower Puna area, home to about 10,000 residents. Lava movement down the slopes of Kilauea is not new. This kind of thing has happened in the past, most notably in 1955 and in 1960, when the village of Kapoho was overrun by lava. Area residents know that they live in a place of high volcanic risk. Pu’u O’o has been continuously erupting since 1983. Houses, beaches, farmland, businesses and more have been wiped out by the volcano’s lava flows over the last 35 years. The village of Kalapana, once a pristine area with a beautiful black sand beach was wiped off the earth by lava in the late 1980s and 1990s. The town of Pahoa was almost inundated with a lava flow from the same volcano in 2014. The summit eruption at the top of Kilauea Caldera within Halemaumau continues. The lava lake recently filled up and has drained somewhat this week. More photos and some videos below. All images unless noted are from the U.S. Geological Survey (USGS). 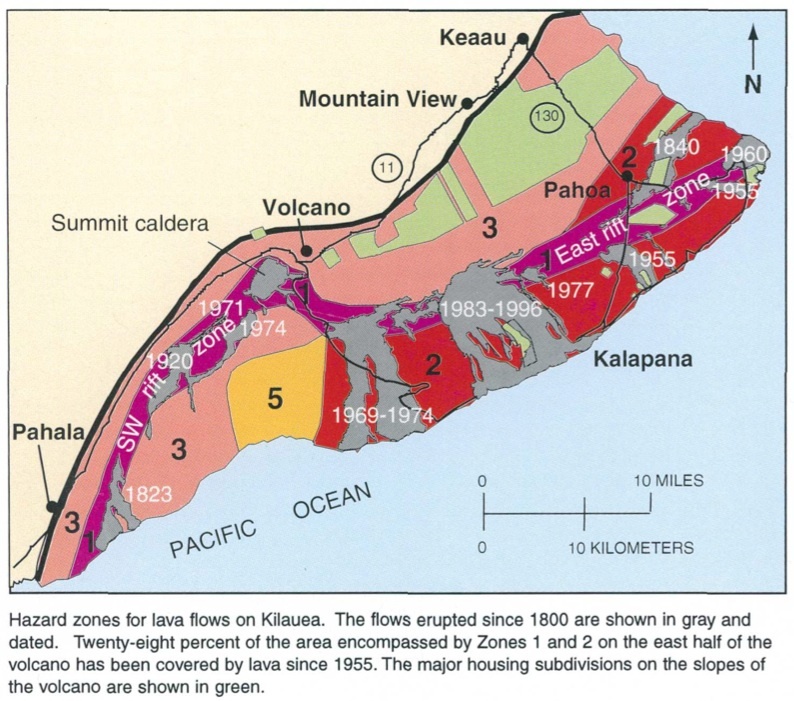 From the USGS publication “Volcanic and Seismic Hazards on the Island of Hawaii”. 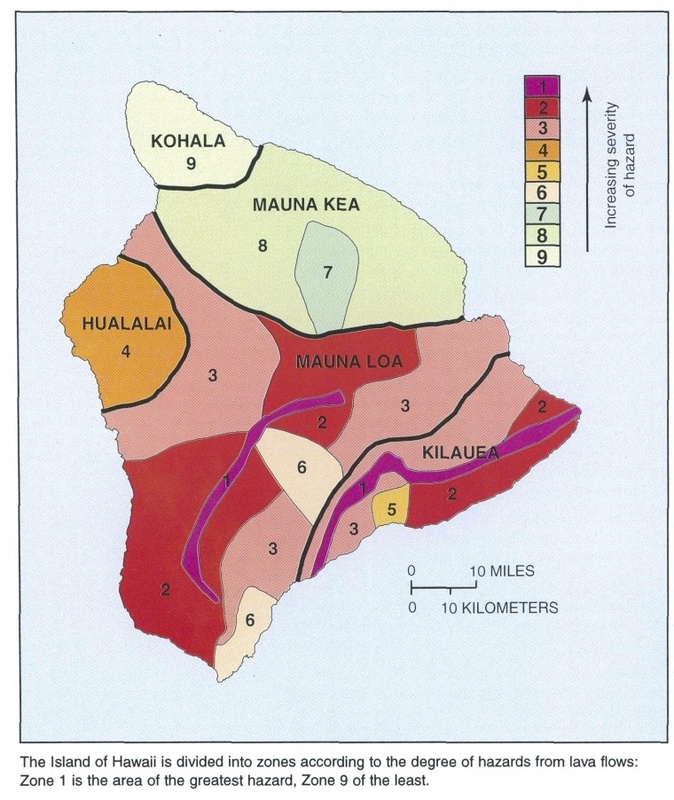 Many parts of Hawaii Island are in Zone 2 hazard risk areas, which are near Mauna Loa and Kilauea volcanoes. Zone 1 is the highest risk areas and they occur along the rift zones of the two major volcanoes. If you want to read more about volcanic hazards on Hawaii Island download the booklet: Volcanic and Seismic Hazards on the Island of Hawaii (PDF). Halemaumau lava lake in Kilauea volcano. 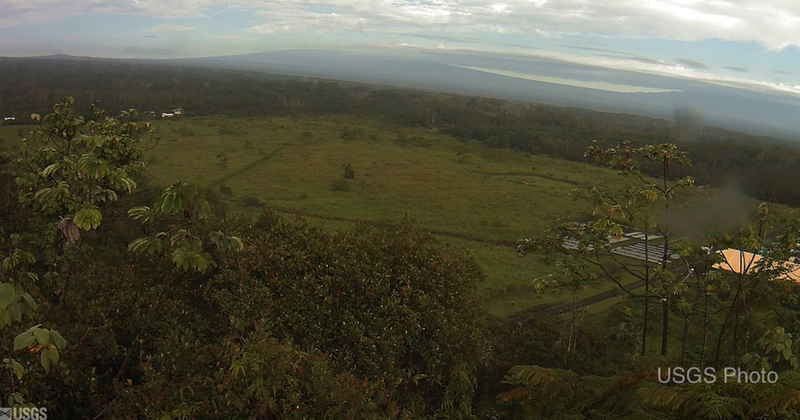 On the gentle, green slope of Kilauea’s East Rift Zone… in the distance to the left is Pu’u O’o and straight ahead is Mauna Loa volcano.